Chief Minister Virbhadra Singh said ‘Nautor’ would be given to those persons who were landless or having a very small patch of landholding with them. He directed the administration to provide land to landless as Nautor on priority besides other facilities of water, electricity etc. The Chief Minister was addressing a public meeting at Kaza today.The Chief Minister said that the bridge over the Keer nallah would soon be erected and the approach road on both sides of the bridge of two kilometres each would be completed soon. He said the bridge was washed away last year in flash floods which was a natural disaster and to politicise such issues was not in the interest of the State. He said that development process takes time. He said the government was always considerate towards the demands of the tribal people and today, Lahaul and Spiti was fast developing and all the villages of the valley would be connected with roads in coming times. Virbhadra Singh said that the Spiti area was most suitable to produce power through solar energy and the project for which foundation stone was laid today was the first of its kind in the State. He added that more such solar and wind power projects would be constructed in the area.He cautioned the people to be aware of those forces who were trying to divide the people of the area and were playing anti-national politics on some pretext or the other.He said that the case regarding construction of Mudh- Bhaba road connecting Spiti with Kinnaur district had been taken up for forest clearance with the Government of India and soon the clearance would be obtained.The Chief Minister announced to upgrade CHC Kaza to 50 bedded hospital from the existing 20 bedded. He assured that the roads in the valley, would be completed on priority and adequate funds would be available for these roads. These roads include Losar to Kyomo, Rangreek to Kwang, Kaza to Langcha and Shithling-Mane-Siluk roads.He said that the data regarding regularising the daily wagers in the valley was being prepared and soon a decision would be taken in this regard. Virbhadra Singh also laid foundation stone of Solar and Wind Energy Power Plant at Rong-Tong to cost Rs. 32 crores, and foundation stone of ITI building at Rong-Tong to cost Rs 1.24 crore. He said that electrician trade would soon be started in ITI, Kaza. He later visited Dhankar Gompa and inaugurated Sermon Hall constructed at a cost of Rs 50 lakhs.Earlier, the Chief Minister was accorded a very warm traditional welcome by the people of the area on reaching Kaza today.Later, in the evening the Chief Minister also listened to the public grievances at Tabo.Vice-Chairperson, National Commission for ST Shri Ravi Thakur thanked the Chief Minster for laying foundation stone of 2.5 MW, Solar and Wind Power Plant at Rong-tong. He listed the development of the area. He said that the alternate route and construction of bridge over Keer Nallah was in progress. He also tabled the demands of the area and urged for stabilising the electric power in the area besides filling up posts of Gynaecologist in the Kaza hospital. 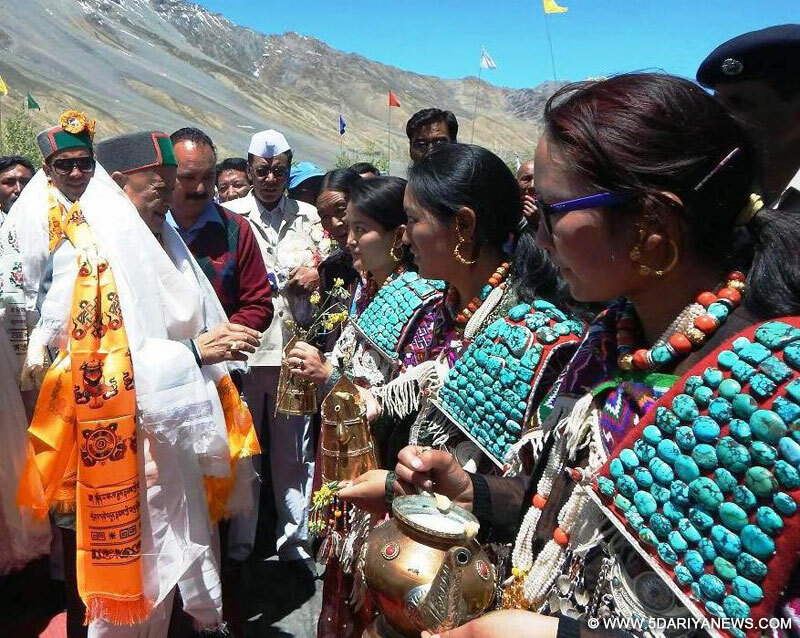 He also urged for early construction of Mudh-Bhaba via Kafnu road connecting the Oin Valley with district Kinnaur. Raghubir Singh Thakur, Chairman, Wool Federation attributed the development of the area to the earlier congress regimes under the leadership of Shri Virbhadra Singh. He said that those people who had been granted Nautor earlier way back should also be allowed to construct their homes in periphery of Kaza.Ex MLA Shri Phungchuk Rai, District Congress President Shri Raptan Bodh, TAC Member Shri Sohan Singh, Gattu Angmo, Dorje Chappal and ADC Shri Sunil Sharma were also present on the occasion.